It's been 13 years since Ken Griffey Jr. reminded us all that he is no longer “The Kid”, but a man who not only respects baseball’s history but can also help make some history of his own. On April 4, 1997, Ken Griffey Jr. called MLB Commissioner Bud Selig with the idea of wearing Jackie Robinson's No. 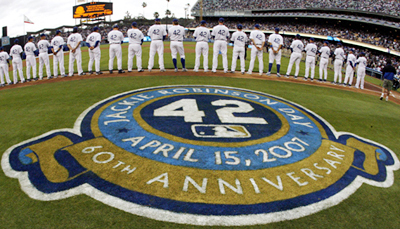 42 on April 15 to celebrate the 60th anniversary of Jackie Robinson's breaking of the color barrier in baseball. "It’s just my way of giving that man his due respect," Griffey said of his one-day switch from a Seattle Mariner’s uniform No. 24 to No. 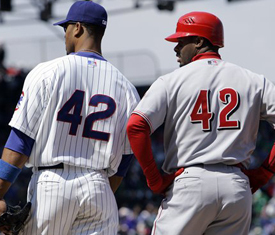 42 (Robinson’s uniform number with the Dodgers). "If it weren't for Jackie Robinson, I wouldn't be in the uniform I'm wearing today," Griffey said. "He should be an inspiration not only to baseball players but to anyone who fights prejudice and hatred." Now every player in the major leagues is wearing No. 42 today for the first time by order of commissioner Bud Selig, an event that brings a smile to Griffey's face. "It was just my way of saying thank you," he said Wednesday in the Mariners' clubhouse. "My way of giving back. I had no idea it would turn into something like this." "This was such a wonderful gesture on Ken's part and a fitting tribute to the great Jackie Robinson and one that all MLB clubs eagerly endorse," Selig said. “I thank Ken for finding another special way to mark Jackie Robinson Day." Griffey isn't always fond of the spotlight, but on this one he was more than willing to share his thoughts. "I don't like to draw this kind of attention to myself, but this is a great cause. A lot of guys in here wouldn't be here if not for that guy," he said. Griffey said his dad and other former ballplayers educated him early on the role of Robinson and his impact on the game. "My dad felt I should know a little bit about baseball history and just history itself," he said. "And a guy named Willie Mays used to pull me aside every year." Last April, to honor Jackie Robinson on the 60th anniversary of his breaking the color barrier in the Major Leagues, Griffey wore six different No. 42 jerseys each one at some point in the game against the Cubs. He had plans for some of them after that. "The first one went to Rachel," said Griffey, referring to Robinson's widow, who Griffey has gotten to meet a couple of times. Robinson, a member of the Hall of Fame, wore No. 42 when he played for the Brooklyn Dodgers from 1947-56. His memory lives on today in initiatives such as the Jackie Robinson Foundation, which was founded by Rachel Robinson in 1973 to provide education and leadership development opportunities for minority students with strong capabilities but limited financial resources. He is also the inspiration for Breaking Barriers, which utilizes baseball-themed activities to reinforce literacy skills, mathematics, science and social history while addressing critical issues of character development such as conflict resolution and self-esteem.